Slowly, over time, I have come around to the green sign with the goddess-like siren at its center. In mythology, this siren/mermaid attempts to seduce mariners with her sweet song, to his unfortunate demise. He may have been a knowledgeable seaman, but proved powerless to the charms of this vixen. Fashioned in 1971, it was an appropriate omen. Starbucks has become an integral part of people’s days, even the most coffee averse. Typically for me, it is a tall americano; I am a simple girl, afterall. At other times, when I crave high maintenance and drama, it is a grande, non-fat, extra hot, half-sweet vanilla latte. I cannot order it without laughing. On days when I need this boost, it is like putting a band-aid on my scraped knee: it doesn’t make the pain go away, but at least I feel like I am trying to something about it. I am from the East coast of Canada, where Tim Hortons rules the roost, so it wasn’t an easy transition, especially since there are no chocolate dipped donuts at Starbucks. 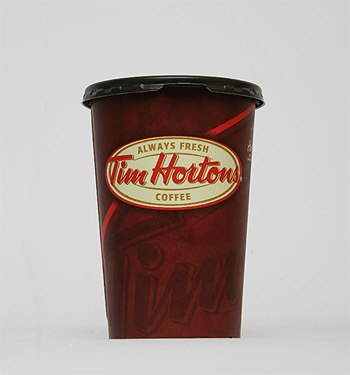 Tim Hortons coffee – although always fresh, as their logo suggests – is more diner variety; it doesn’t come from a fancy espresso machine, but rather a drip style industrial strength coffee maker. You commonly hear people approach the counter asking for “an extra-large double double, please,” which translates to a lot of coffee with a lot of cream and sugar in it. Then they throw a toonie ($2) on the counter, and wait for their change. Tim Hortons is the much more economical of the two, hands down. Folklore abounds which suggests Tim Hortons puts nicotine or MSG in their coffee, people find its coffee so addictive. Both claims of course have been proven false, the people spreading this rumor perhaps have yet to realize caffeine itself is the addictive ingredient. Yet when I moved west, Tim Hortons didn’t follow suit. There were no familiar brown storefronts with neon signs, but green signs with vixens in the middle were plentiful. In fact, on every corner, it seemed. That siren beckoned me again and again. Before I knew it, I was accustomed to its verging-on-bitter, dark taste, and prepared to spend three times as much as I had back east for my regular cup of joe. I was memorized less by the coffee itself than its sheer volume of storefronts. When you start noticing a lack of Starbucks in Vancouver, you are nearing its outskirts. I have steadily expanded my repertoire, discovering and falling for its eggnog lattes, Vivanno smoothies, vanilla rooibos tea, and its and oatmeal when I am traveling in lieu of cold scrambled eggs at hotels (and don’t let any barista bully you into choosing between the nuts or the dried fruit, you are entitled to both). On the road, Starbucks becomes a refuge, a little piece of home amongst the chaos of uncertainty. I still seek out local mom and pop cafe’s, many of which rival Starbucks coffee and atmosphere, but if in a hurry and on a mission, sometimes familiarity works better. By now I am addicted to this part of my day, as necessary as showering, or cocktails on Fridays, in that it is something I look forward to. I like to change up my locations: I hit the Dundarave Starbucks for meeting my friend for writing dates, Ambleside Starbucks assures me easy parking, Park Royal Starbucks when I need to do other errands, Horseshoe Bay is my stand alone favorite, a restful Starbucks where you can watch the ferries docking and leaving. Its multitude of locations assures its usefulness, and it continually infiltrates my day. For economic reasons, I frequently make coffee at home with my trusty french press with the broken beak, and after loading it up with Starbucks Breakfast Blend grinds, it tastes dangerously close to my typical americano. I can’t seem to escape the clutches of that sea goddess; Starbucks is the largest coffeehouse in the world for a reason. But on the days when my only glimpse of her is from the bag of beans in my own kitchen, I miss that siren with the Mona Lisa smile. I have introduced Debbie to your talents!! She is very impressed! Keep them coming. I think you should be publishing a column in the Herald for Maritimers gone astray! Thanks – but as my brother, you might be over selling me. Love your support and encouragement, and you guys too for that matter! D, I want you to be my ghost writer. Every single one of your posts resonates with me……I know it’s YOUR life, but I feel like you’re telling MY stories, albeit ever so eloquently! I first started haunting Starbucks at Pike Place Market in Seattle in the mid 70s. I am addicted to coffee, admittedly, but it’s embarrassing to recognize how much a part of my routine this has become. There is something about that siren’s song….. I made a pilgrimage to that original nondescript Starbucks last year, and must say it felt like holy ground!